One of the most quick, easy and delicious breakfast is french toast. 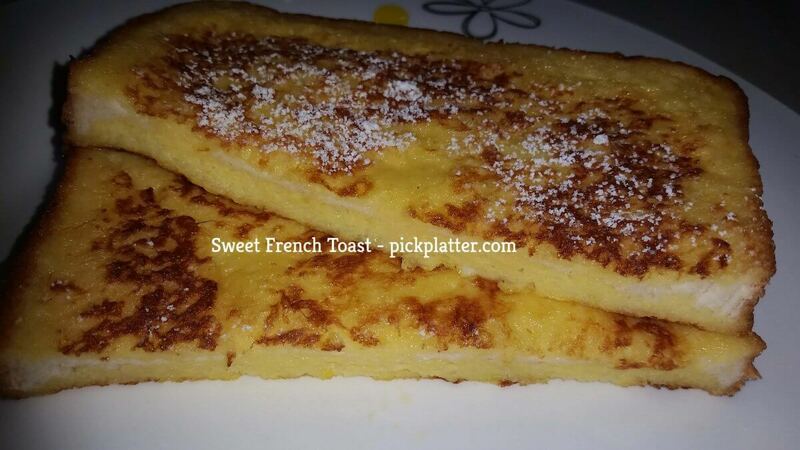 Sweet simple and very aromatic sweet French toast. This recipe is an all time kid’s favorite recipe and is a great option for desserts as well. Break eggs in a bowl. Add two tbsp sugar. Beat well egg and sugar together. Add Vanilla essence powder/liquid and mix. I am using Vanilla powder. You can use Vanilla essence liquid as well. Add 1/4 cup of milk and beat again. Heat tawa/pan. Pour few drops of oil just to avoid burning of butter. Put 1 tbsp butter on tawa and melt. Dip the bread slices in the egg mixture from both the sides. Place it on the hot tawa. Cook both sides until golden brown on medium flame. Once golden from both the sides take it out. Repeat same steps for other bread slice. Sift some icing sugar(optional) on top of it and serve hot.